Uh oh, you’re in the checkout line and realize you forgot your reusable bags? What to do? Take the plastic bags and reuse in a variety of ways later. Greening your daily activities is easier than you think. 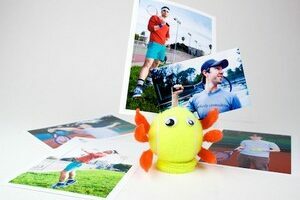 Check out some of these ideas and then share some of your own. Tomato cages can be awkward to store once their purpose has been served. Why not turn them into a stylish pieces of decor instead? 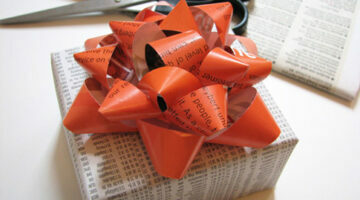 Don’t waste your money, or the environment, on shiny new wrapping paper. 4 Things You Would Never Think To Recycle… But You Can! Reducing your amount of waste can be more difficult in the suburbs, but with a little common sense and creativity, it’s perfectly possible. A profound love for reading can get costly for both your wallet and the environment. How can you save money and the planet but still quench your reading thirst? Visit your local library. Add some stylish shelf and towel space to your bathroom for the big fat price of NOTHING! Tasty, frosty beverages an an essential part of beating the summer heat. Grab an old bike crank arm and craft the best brew and bottle opener around. Who wants boring reusable bags? Make a statement or start some conversations with a clever or funny canvas bag. Want to liven up your outdoor space? Try making some chic hanging chairs from shipping pallets! Even for die-hard walkers and bikers, sometimes you just have to drive somewhere. Why not make your car work for you if you do? Why put plastic produce bags in your reusable shopping bags at checkout? 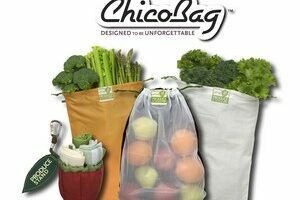 Snag a set of the only reusable produce bags you’ll ever need. Hats off to this AMAZING pug! 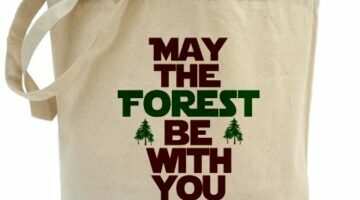 If he can live green, so can we. 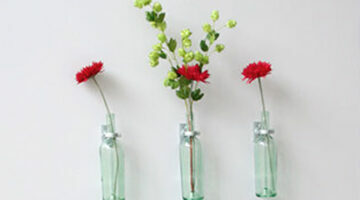 These 2 ridiculously easy and creative projects are the perfect ideas to bring some flare to any space while reusing items that have outlived their purpose. 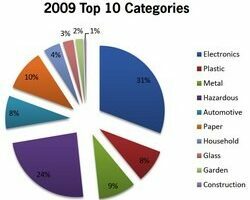 Electronics are sometimes difficult to recycle…yet they were the most recycled item in 2009. See what other items top the most recycled list. Using your own reusable coffee mug is an easy way to live a little greener. 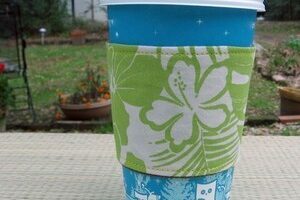 Grab a reusable coffee sleeve from Glue and Glitter with free shipping to cut down on unnecessary waste even further. The fun doesn’t stop when the alcohol has run dry…because now you’re free to make that empty wine bottle into a tiki torch or wall mounted vase! What’s more fun than polishing off a bottle of whiskey? 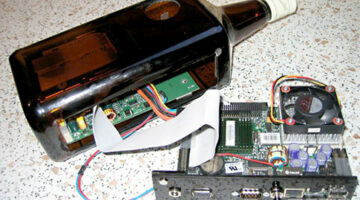 Using the empty bottle to make your own server or PC! A fun, simple, and easy way to turn turn ping-pong balls and Christmas lights into diffused party lights for your next event. Polishing off a bottle of wine is always fun…but making some creative stuff out of that empty wine bottle is even more fun!